This post is a compilation of link to generic tips on the use of photography-related hardware and software. Using iPhoto’s Places without a GPS-enabled camera by Rob Griffiths, Macworld.com — Rob’s methods require the use of Apple’s iPhone and iPhoto. A number of comments in the article recommend the use of an iPhone application, GeoLogTag. 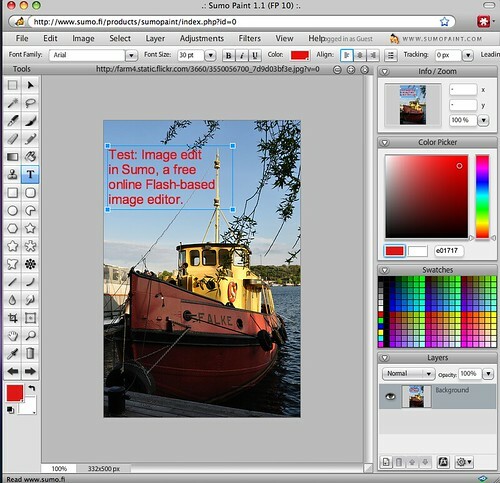 Sumo Paint: Website | Application — This is a Flash-based web application with some pretty powerful features. Its layout reminds me of what you’d typically see in the Adobe Photoshop or Adobe Photoshop Elements software. You also get the goodness of Layers in this application. The screenshot below shows a Sumo Paint editing session, in which I opened up a photo from my Flickr account. Sumo also allows you to upload and edit photos from your own hard drive, or your optional Sumo account (click to view a larger version). You can then save the edited image to your hard disk, or to your Sumo account. The site doesn’t require registration, and you can use the application immediately once the Flash components have been downloaded and cached on your computer.. Subsequent application launches are much faster. Read more on Sumo in a MacWorld article by Kris Fong titled Sumo Paint: Photoshop-like Web-based image editor, and this forum discussion on DPReview.